As an Irish chick with a birthday on Saint Patrick’s Day, I am all about spreading the good, green cheer. What other holiday allows you to sprinkle some green magic, while also hunting down organic phenomena like four-leaf clovers and mischievous leprechauns? I have never been one for trying to find the ‘pot-o-gold’ at the end of the rainbow or capturing little bearded men, but the folks at FamilyFun.com have some clever and tricky ideas for celebrating Saint Patrick’s Day while also recycling household items like cereal boxes, oatmeal containers, and other cast-off materials found around your home. Click the link below for ideas on how to make March 17th cleaner and greener with some DIY recycling magic that you can easily sprinkle about. Eco-Friendly Saint Patrick's Day Crafts for Kids! As an Irish chick with a birthday on Saint Patrick�s Day, I am all about spreading the good, green cheer. What other holiday allows you to sprinkle some green magic, while also hunting down organic phenomena like four-leaf clovers and mischievous leprechauns? 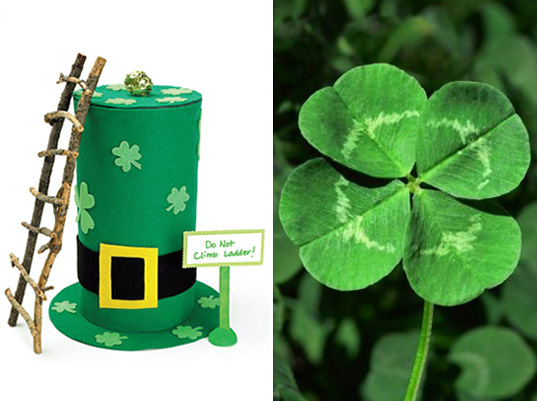 I have never been one for trying to find the 'pot-o-gold' at the end of the rainbow or capturing little bearded men, but the folks at FamilyFun.com have some clever and tricky ideas for celebrating Saint Patrick�s Day while also recycling household items like cereal boxes, oatmeal containers, and other cast-off materials found around your home. Click the link below for ideas on how to make March 17th cleaner and greener with some DIY recycling magic that you can easily sprinkle about.